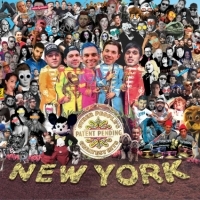 As they get ready to hit the UK for their Spring Break Tour, American party punkers Patent Pending have announced that they have a new cover album! While the band has been known for playing cover songs at their shows, this time they were so excited about the tracks chosen, and the way they were revisited, that they absolutely had to hit the studio to record them. 'Other People's Greatest Hits' comes out on May 26th via Rude Records, and the first song "Spice Up Your Life" is available here. It’s rare that a band drops a debut release with the amount of polish and ambition that is seen across The Without’s new EP “Factions”. The Portland-based metal outfit describe themselves as a creative venture between five lifelong friends, but this isn’t the US rockers first rodeo sharing they had been fans of each other’s work for years before coming together as “The Without”. Memphis indie-rockers China Gate announced their upcoming EP release, 'Good Grief' is scheduled for release on Friday, 19th May. Portland, OR-based rockers, The Without have dropped their debut EP!